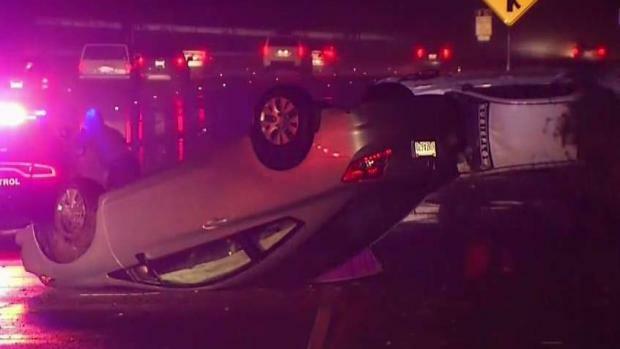 A number of car crashes snarled traffic across the Bay Area during the Thursday morning commute as another round of rain soaked the region. A big-rig around 5 a.m. slammed into a power pole in Fremont, knocking out power for roughly 3,000 customers in the area near Auto Mall Parkway and Boscell Road, according to police. The crash temporarily shut down both directions of Auto Mall Parkway. The power pole was thrown across several lanes of traffic, but no one was hurt. Full power in the area immediately surrounding the crash scene is expected to be restored by 5 p.m., according to PG&E. A number of car crashes snarled traffic across the Bay Area early Thursday as another round of rain soaked the region. Mike Inouye and Kris Sanchez reports. In the South Bay, overturned vehicles briefly blocked all northbound lanes of Highway 85 near Winchester Boulevard in Los Gatos around 5 a.m., but only minor injuries were reported, according to the California Highway Patrol. Despite the proximity, the crashes happened independently of each other. CHP officials said speed played a role in the wrecks. Around the same time along the Peninsula, a collision blocked four lanes of southbound Highway 101 at Shoreline Boulevard in Mountain View, according to the CHP. Drivers are encouraged to slow down and keep a safe distance between the cars in front of them when rain is falling. Track the latest road conditions using NBC Bay Area's traffic map.